The SOIC chip pattern sits at right angles to the DIP pins, which took some getting used to. The slightly defocused wire connecting pin 4 (on the IC) to pins 5, 6, and 7 (on the PCB) selects address 0x48. 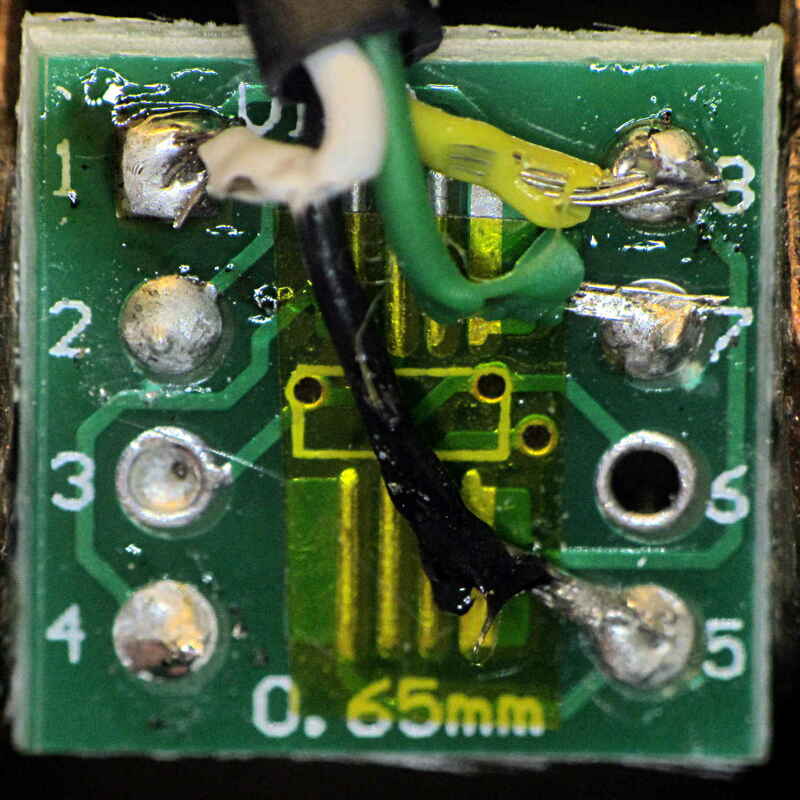 So I flipped it over, soldered four wires (+5 V, GND, SDA, SCL) to the numbered pins on bottom of the board, made up a little header for the other end, wired a socket strip on the crystal tester board, plugged it in, and … nothing worked. Turns out that the other side of the board carries a TSSOP pattern, which I’d neatly masked off with a snippet of Kapton tape, surrounded by eight numbered pins. Of course, those pin numbers correspond to the TSSOP pattern facing you, so they’re mirror-imaged for the SOIC pattern on the other side. The insulation looked a lot better the first time I soldered the wires to the PCB. Honest. It’s snuggled chip-down against the top of the 125 MHz oscillator can, with a dab of heatsink compound improving their thermal bond and a yellow cable tie around the foam holding them together. 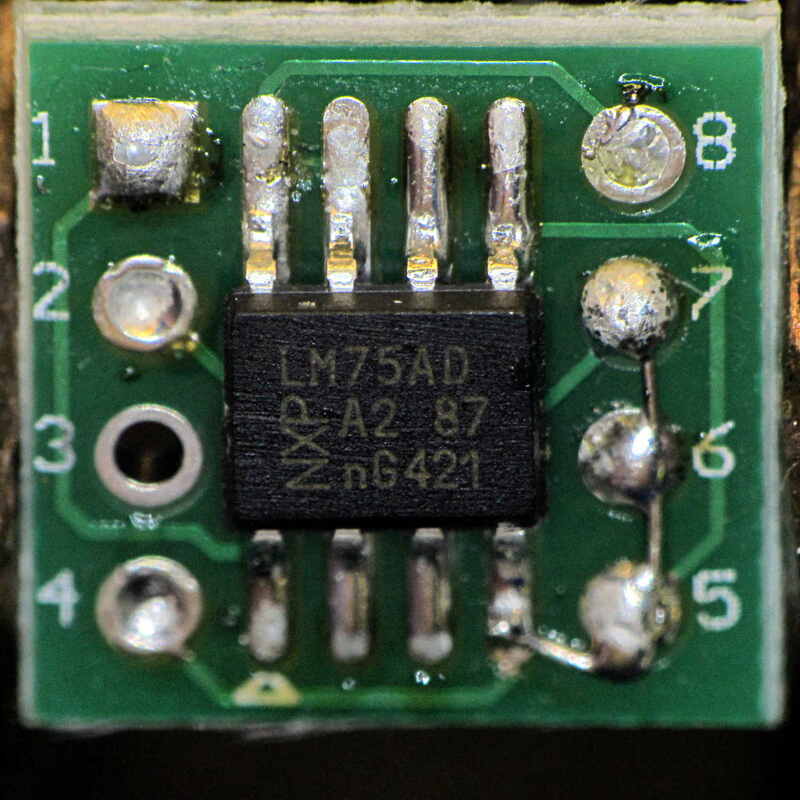 The socket header is wired pin-for-pin to the DAC I²C socket directly above it. 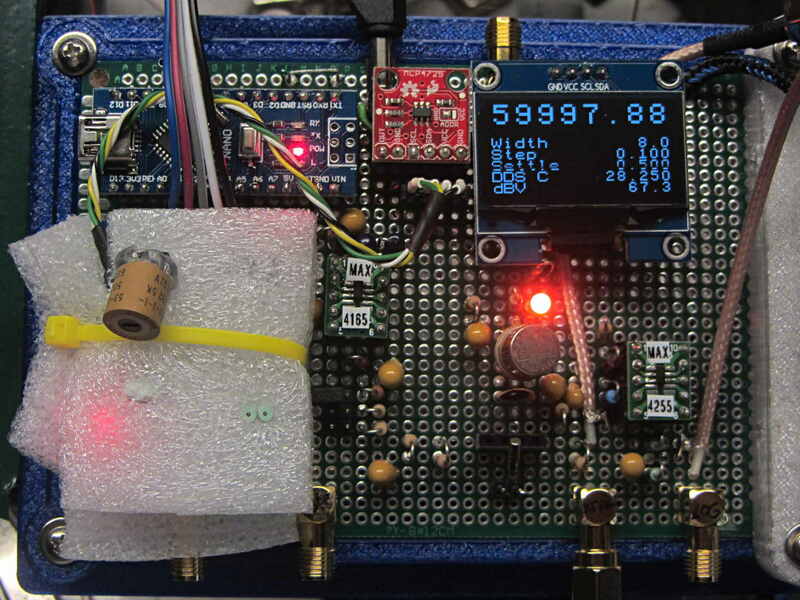 The OLED temperature display shows 28.250 °C, because the oscillator just started up in a cool basement. It’ll eventually settle around 39-ish °C, where its output should be pretty close to the 125 MHz – 344 Hz value hardcoded into the source. Oh, that’s a 3 mm amber LED next to the relay can: much less glaring than the white LED, no matter what it looks like here.